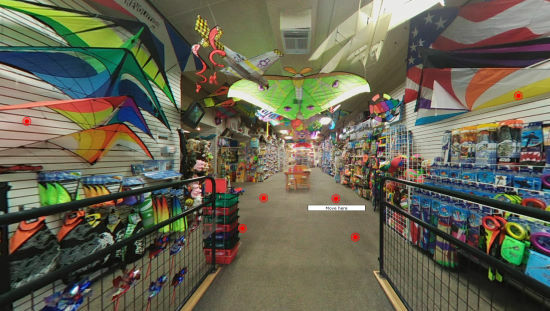 Welcome to the MACkite Toy and Surf Shop virtual tour! Now it's easy to explore our store from anywhere in the world. Click your mouse anywhere on the image and drag it to look around. We're a kite store, so don't forget to check the ceiling! Use your mouse's scroll wheel to zoom in and out for a closer or wider view. Click the red dots on the floor to move around the store. Something catch your eye? Look for a red dot nearby and click it to be taken directly to that category in our online store. We're adding more items all the time so there's a good chance you'll be able to find it there. But if you can't, we welcome orders by phone: 866-428-2335. Want the full experience? Right click the image and choose "Enter Fullscreen". You can press "ESC" at any time to exit fullscreen mode. Keep your eyes open: you never know what silliness you may spot!